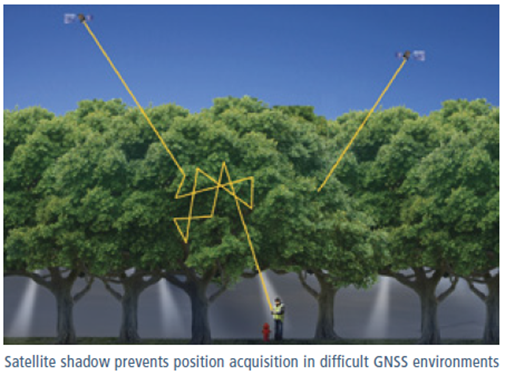 Trees and buildings create “satellite shadows”, limiting the areas where you can reliably collect high-accuracy Global Navigation Satellite System (GNSS or better known as use of the GPS (USA) or GLONASS (Russian) satellites) data. Interpine operate high grade GPS for mapping / GIS activities and installation of LiDAR ground control forest plots. 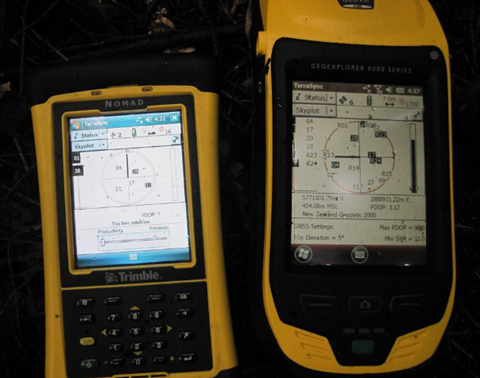 We have recently updated our fleet of units to the Trimble Geo6000 XH model. This uses a new technology called Trimble Floodlight. With this technology, the GeoExplorer 6000 series continues to deliver productive, usable data under dense tree canopy or for that matter in heavy in urban canyons (less of an issue for us J). You can work with fewer disruptions, meaning better data, faster, at less cost. What level of performance can be expected ? The results speak for themselves. Interpine have been operating the Geo6000 XH units for over 6 months, and have seen large gains in field survey productivity. Data collection under dense canopy and in tough terrain and weather conditions is possible in a matter of minutes not hours (compared to our experience with the Trimble ProXT units). The image below is from Trimble, but we are also seeing the same levels of improvement. Red is with a GeoExplorer 2008 without floodlight, the yellow shows the same routes measured using GeoExplorer 6000 with floodlight enabled. We also have not needed to mount the receiver up a 5m pole to get effective coverage, which has meant a reduction in the equipment the teams carry and the time needed to setup prior to collecting data. So How Does Floodlight Technology Mitigate Satellite Shadow ? By combining GPS and GLONASS tracking, satellite availability is increased by up to 60% over GPS-only positioning. Advanced tracking algorithms speed up signal acquisition and ensure more stable tracking of satellites with weakened signals. With steadier tracking comes smoother positioning that is less prone to drop-outs and spikes caused by erratic satellite tracking. Floodlight technology uses altitude-constrained positioning to reduce the impact of weakened or blocked signals. This technique limits the impact of weak signals, allows 3D positioning with fewer satellites, and improves horizontal and vertical accuracy. Why is Floodlight Technology Better than Other Techniques to Improve Position Availability? Receivers that address satellite shadow by offering GPS and GLONASS positioning are only solving part of the problem. Other solutions that use lower quality thresholds may increase position yield in obstructed conditions, but do so at the expense of accuracy. Floodlight technology tackles satellite shadow by improving satellite visibility and tracking while safeguarding against the effects of weak satellite signals on position quality, achieving the best possible position. 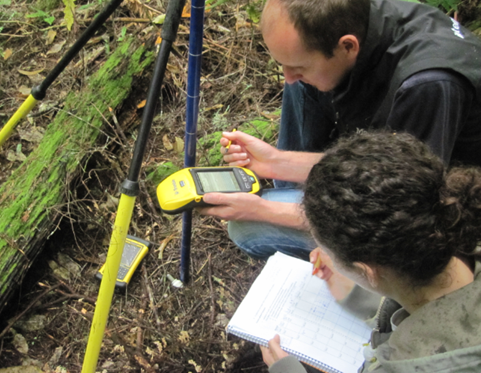 Figure 3: Our technical team putting the GPS models to the test in dense Douglas fir forests not far from our Rotorua office. 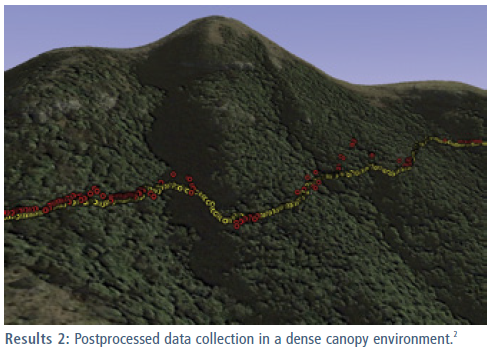 Figure 4: Under a dense native understory and Douglas fir canopy, light rain, and ~30 degree slope environment, here is an example of ProXT receiver mounted on 5m pole above lower undergrowth (on left shown on Bluetooth connected Nomad handheld) with just 2 active satellites available, and the Geo6000 XH unit (Right) with 6 available satellites at ground level. The results speak for themselves.